This user-friendly book and CD features fourteen great jam session tunes for learning musicians. Each one is slowed down for beginners, and performed up-to-speed for those ready to play along at a faster pace. 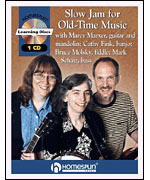 This play-along CD will be a big help for players of any old-time instrument � fiddle, banjo, mandolin, bass or guitar.